One of the best ways to have stress relief from a long hectic week is to do horse riding to renew your energy 🔅🐎. 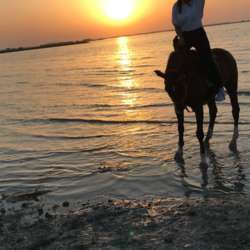 Therefore, we have an adventure to ride a horse for a tour around the historical Bahrain fort area. I have reserved Protected content with the hamlets and the Riding Instructor to learn us who we can ride the horse in a very simple way during the tour. The period of the tour will be for one and half hour. If you are interested and you can make it for sure please sign in as we need at least 10 persons in. We need to confirm our booking by Thursday 7/2/2018.